Based on the author's years of experience working with Toyota's master teachers and with companies in the midst of great change, this book follows the story established in the Shingo Prize-winning book, Andy & Me: Crisis & Transformation on the Lean Journey. 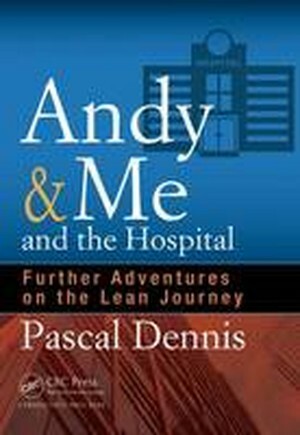 In a cool and readable style, Andy & Me and the Hospital: Further Adventures on the Lean Journey follows Tom Pappas's relationship with Andy Saito, a reclusive retired Toyota guru. Tom and Andy are pulled into a major New York City hospital in crisis. Can they translate and apply Toyota's powerful methods and thinking to save the hospital from disaster? Using a compelling novel format, the book demonstrates how to apply Lean thinking in a healthcare setting. It illustrates the situations, characters, and plant politics you will most likely face as you progress through your Lean healthcare journey. As the story unfolds, you will discover the way of thinking and behavioral changes required to implement proven Toyota Production System (TPS) methods, tools, and thinking in healthcare. You will learn: * What a Lean transformation in a hospital should look like * The overall approach you need to take * The leadership and behavioral changes required * How to improve processes and better develop and engage people * How to build and sustain a Lean management system * How to translate and apply Deming's "profound system of knowledge" This book provides clear and simple guidance on what it takes to successfully implement Toyota methods in healthcare settings. It shares helpful insights on how the different elements need to fit together to deliver measurable process improvement results. Just like its bestselling predecessors, this book includes study questions after each chapter to support learning and to facilitate discussion in workshops or classroom settings.